Hi there! 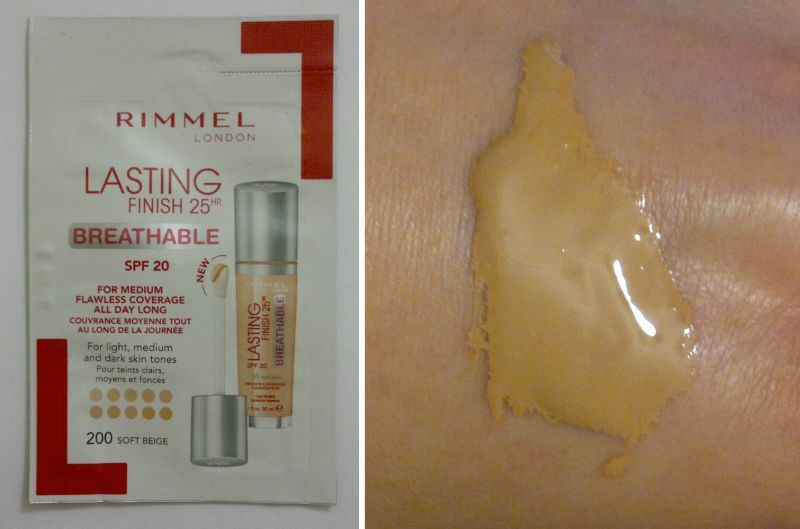 Today’s post is about Rimmel‘s Lasting Finish 25 HR Breathable Foundation With SPF 20. The shade I’ve tried is 200 Soft Beige. I would have needed the lightest shade, but this one was alright for the purpose of testing the foundation on a stay-at-home day. This foundation promises medium flawless coverage that lasts all day as well as UV protection. Applying the foundation is easy – Rimmel says it’s best applied with your fingers or with a make-up brush. I’ve now tried this foundation, and here’s what I think. I can make a long story short – I think this foundation is awful! It’s not suitable for dry skin at all. The foundation dried too quickly, it creased badly, and it highlighted lines that I’ve never even seen before! I also found the coverage disappointing. I think the coverage is light to medium at best. Based on my experience, I wouldn’t recommend this foundation at all. I make room for the possibility that it might work for other skin types, but if you have dry skin, this foundation isn’t for you. Rimmel‘s Lasting Finish 25 HR Breathable Foundation With SPF 20 is available as 30ml for £8.29. Hi there! 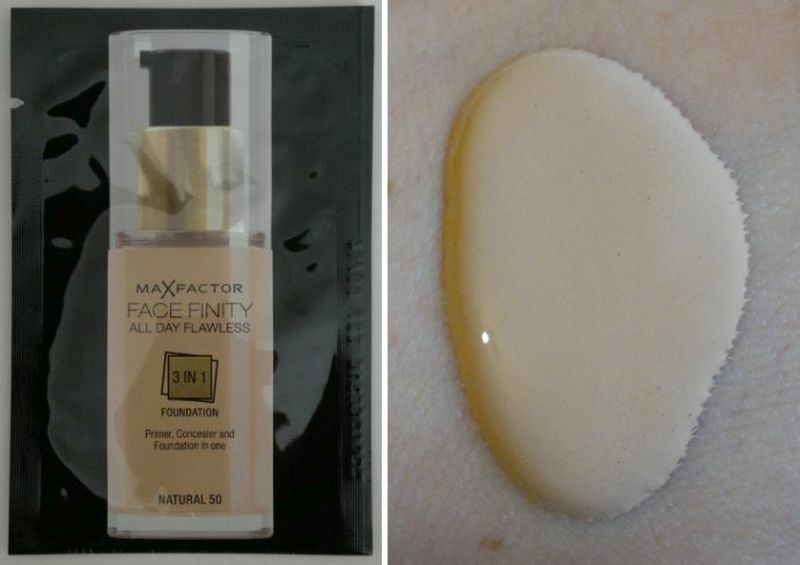 Today’s post is about Max Factor’s Face Finity All Day Flawless 3 In 1 Foundation which I had a sample of. The shade I tried was Natural 50. OK, so what does the product do? In a nutshell, this foundation promises to prime, conceal and cover (this is the 3 in 1 bit). And it claims to provide longlasting and flawless coverage. Read on if you’d like to know if it’s any good. I was very impressed with the way the foundation looked on me because it gave me pretty much full coverage. Despite this, the foundation didn’t look cakey or unnatural, and it didn’t settle into my fine lines. So yeah, I think the finish was almost flawless! I checked my face numerous times throughout the day, and I’m happy to report that the foundation stayed put. I wore it for 12 hours, and I really liked it! To make a long story short – I was impressed with this foundation. I know I will buy a full-size bottle in the not too distant future. I would, however, choose a lighter shade. Max Factor’s Face Finity All Day Flawless 3 In 1 Foundation is available as 30ml for £12.99. Hi there! 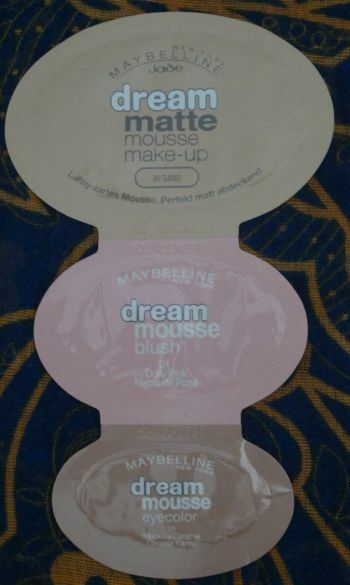 Today I’m reviewing Maybelline’s Dream Satin Liquid Foundation which I have (well, had) a sample of. The shade I tried is Sand. This foundation promises to make pores appear invisible and to create a perfect complexion. Sounds… cocky! I’ve now given the foundation a try, so let me tell you more about it. I love how the foundation felt when I applied it. It was dreamy. And satiney. Wow! However, it was impossible to blend the foundation into my skin. I tried, and tried, and tried again – but it didn’t work. And I was disappointed to see that this foundation settled into my pores and fine lines, thus making them more visible. This foundation doesn’t provide much coverage. However, it still manages to look unnatural and cakey. And on top of that I’ve noticed that this foundation oxidises quite a bit. My face looked orange after just a few hours. Based on my experience I wouldn’t recommend this foundation. If you want a natural looking foundation that provides good coverage without looking like it’s been caked on, you need to look elsewhere. 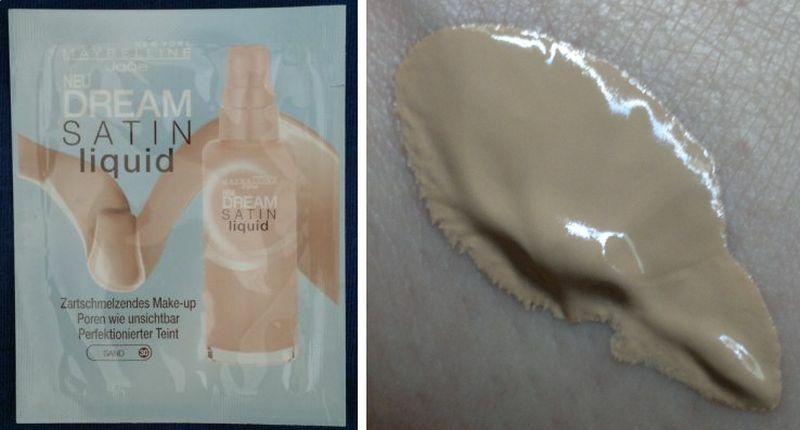 Maybelline’s Dream Satin Liquid Foundation is available as 30ml for £8. Hi there! 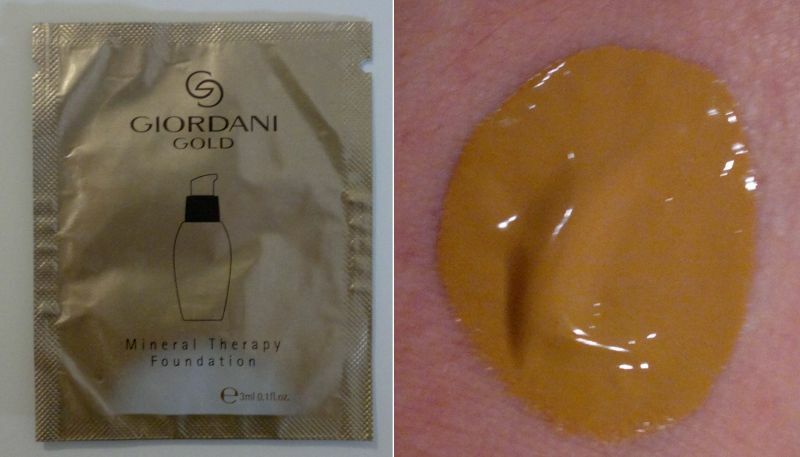 Today’s post is about Oriflame’s Giordani Gold Mineral Therapy Foundation in Natural Beige. I’ve had this sample for quite some time. And I haven’t been keen on giving this foundation a try. That’s because, based on my experience, those ‘natural beige’ shades are usually way too dark for me (I’m a pale redhead). However, I’m making an effort to use the products I already have – and that includes all those samples too! Then I took a really close look in the mirror, and I was ready to wash my face again! My face looked orange – but that wasn’t even the main issue. The main issue was that this foundation didn’t provide any coverage at all. I didn’t even look like I was wearing make-up. I looked like I had slathered my face in carrot oil. Ridiculous! But since I wanted to give this foundation a chance, I left it on for the entire day. I must say that I expected the foundation to settle into the fine lines, and I was sure it would highlight dry patches – but it didn’t. And it actually felt nice on my skin. Now, I make room for the possibility that I helped by not applying powder, but who knows? And who cares? I certainly don’t because this foundation doesn’t cover anything at all, so I wouldn’t buy it anyway! Oriflame’s Giordani Gold Mineral Therapy Foundation has been renamed. It’s current name is Oriflame Giordani Gold Long Wear Mineral Foundation. It’s available as 30ml for £18. Hi there! Today’s post is about a foundation I’d never recommend – it’s NYC’s Skin Matching Foundation in 685 Fair. I bought this foundation for £1 only. So I knew it wouldn’t be great. But I was hoping that it would be OK and that I would be able to wear it under my actual foundation – as a BB Cream or instead of a primer. However, I’ve now binned the product. Here’s why. First of all this shade is quite dark. I’ve seen foundations called ‘natural’ or ‘medium’ which were lighter. So this one isn’t for fair skin. In addition, I’m not sure why the product claims to adapt to skin tone – because it doesn’t. 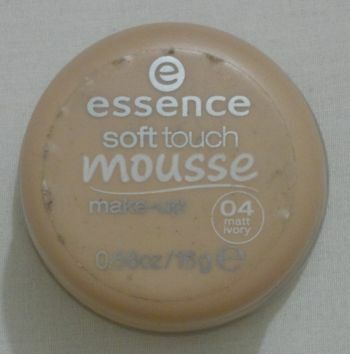 If you see this foundation at a bargain store, don’t be tempted – no matter how cheap it is. There’s a reason why this full-size foundation ended up on offer for £1 in the first place.